"Their voices shall never be silent; We walk with the ancestral spirits." Historical Land in Van Zandt County 12 miles west of Tyler and 85 miles east of Dallas. 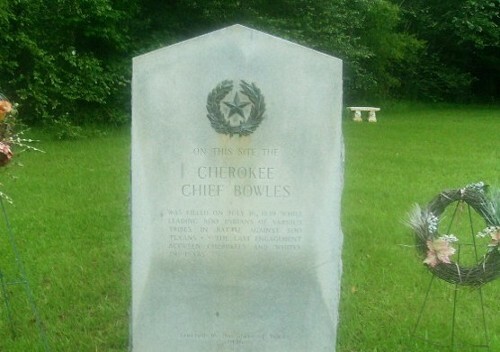 On this land, the Texas Cherokee and 12 associated tribal bands, under the leadership of Chief John 'Duwa'li' Bowles, Chief Big Mush and six other Tribal Chiefs / Leaders, were slain July 16, 1839. This massacre, by the Republic of Texas Army, under the direction of President Mirabeau Lamar, took the lives of many innocent tribal men, women and children. The associated tribal bands on this land included: Cherokee, Shawnee, Delaware, Kickapoo, Quapaw, Choctaw, Biloxi, Ioni, Alabama, Coushatta, Caddo of the Neches, Tahocullake, Mataquo and possibly other groups. Many now and forever consider this LAND sacred ground. The spirits of the men, women and children slain on this land are still present today. Their BLOOD and TEARS forever stain THE LAND. JOIN US FOR OUR ANNUAL "BATTLE OF NECHES" MEMORIAL CEREMONY JULY 13, 2019! We Are the Keepers of the Land!